Ahh, the land of fire and ice. Beautiful place, frustratingly unpredictable weather. This makes knowing what to pack for Iceland to prepare for all kinds of weather extremely important. Take it from me, the Florida girl who visited for the first time in October, 2016, and failed to bring a winter coat. The weather forecast said it won’t be dropping below 32°F, I’ll just bring layers, I thought. Ha. I was so naive. For starters, I failed to factor in all the wind and rain that time of year, making that 32°F feel a lot closer to -32°F. Especially when the rain seeps into your jeans. By far the most important item you will pack on your trip to Iceland will be a loose-fitting raincoat that you can wear over your layers. We love the options below because they are longer, providing more coverage against the elements. Make sure to purchase a raincoat a size larger than your usual size so it will fit comfortably over your layers. If traveling in the cooler months (September-April), you’ll need a winter coat. 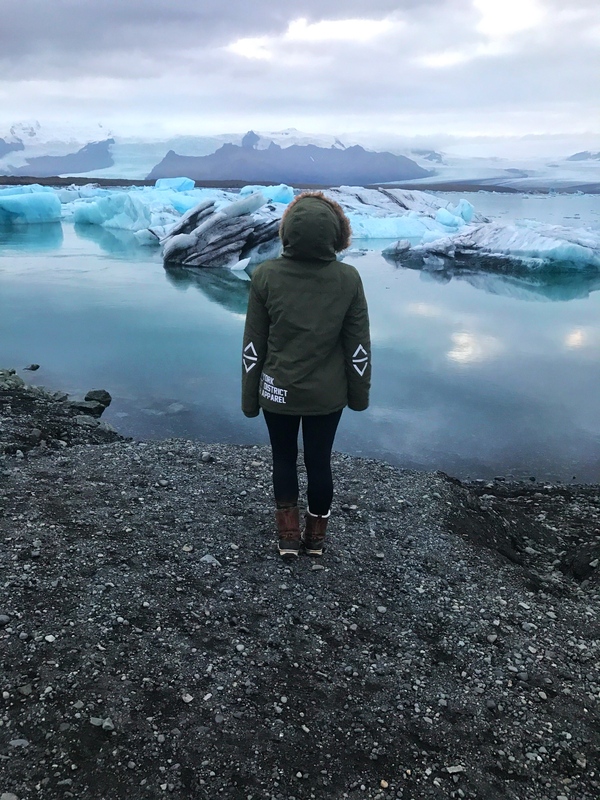 A hooded, water and wind resistant jacket will help you weather the unpredictable fall, winter, and spring seasons in Iceland. When I first visited in early October, I forgot to bring a winter coat. I ended up spending $400 on one of the cheapest coats I could find at the Reykjavik Mall. Don’t make the same mistake I did, pack a parka! If we’d packed waterproof pants to wear over our jeans when we visited, we would have been spared a lot of discomfort. There’s nothing worse than hiking in the rain and cold in soaking wet jeans. We recommend bringing a pair of rain pants (or snow pants if traveling in the winter) to wear over your regular pants for those rainy day hikes. Wearing layers makes Iceland’s unpredictable weather manageable. It can go from rainy and freezing to sunny and warm all in a couple of hours. Being able to pack on and shed layers throughout the day will keep you comfortable and prepared no matter what weather Iceland throws at you. For spring-fall, a tank top or short sleeve shirt will do just fine. In the winter however you’ll want to wear thermals. Thermals may be a safe bet to have during the shoulder season (spring and fall), especially for sleeping in. Go for a wool base layer for extra comfort and to keep moisture away. For summer, this may be a short sleeve shirt, light long sleeve blouse, flannel, etc. It’s a safe bet to bring half short sleeve shirts and half lightweight, long sleeve shirts to be able to layer. The days are long, but it can still get chilly during evenings and nights. For spring, winter and fall, a wool or knit sweater are stylish and comfy. Consider purchasing a local wool sweater while in in Iceland (heads up, they can be pricey)! Flannels, long sleeves, and button downs are great as well for this time of year. For fall and spring, a vest keeps your core warm and your arms free when it’s too warm to wear a jacket, but cool enough to need an extra layer. It also adds an extra layer of insulation in the winter when worn under a winter coat. Pack 1-2 lighter jackets to wear when a winter coat isn’t necessary. Plus, this gives you more outfit options to mix and match! For winter, bring a warm coat lighter than your winter jacket (like the two black coats below) and a warm, cozy cardigan. For summer, pack a light cardigan (like the yellow one below), and a puffer jacket for cool mornings and evenings, or trips into the glaciers. Bringing comfy loungewear for car/plane rides and to sleep in is crucial. Things not to forget include a hoodie, sweatpants, leggings, and thermals to sleep in or wear as a base layer. When deciding what type of hiking boot to bring, it’s important to look for a breathable, waterproof pair with Gore-Tex technology. I opted to bring snow boots in October and was happy I did. Many of the hikes we did were extremely wet and muddy, and the snow boots provided the traction and height I needed to not slip when walking calf deep in the mud. If going in the summer, a pair of Timberland’s will do just fine, as it is far less wet than the rest of the year. Any comfy pair of sneakers will do. Bring a pair you aren’t afraid to get dirty, especially if exploring the urban areas between September and April, as it will be far more wet this time of year. Don’t forget to pack a pair of comfortable lounge shoes to wear around the hotel/hostel/AirBnB! For hiking, bring a pair or two of wool socks. They provide extra warmth and dry quicker than cotton socks. For the summer, a light scarf is perfect for keeping your neck warm and dressing up a casual outfit. For cooler months, a heavier knit scarf is recommended. For spring-fall, bring a pair of sunglasses. For the winter, they aren’t necessary, as it is dark throughout most of the day, but it doesn’t hurt to have them for those 2-3 hours of sunlight (ever hiked in the snow on a sunny day without sunglasses? It’s blinding!!). Iceland is full of hot springs. Forget the touristy Blue Lagoon and head to one of the many hidden hot springs around the island. We recommend a stylish one piece to keep your midsection warmer, but really any bathing suit will do. So there you have it: all the clothing and accessories you’ll need for a trip to Iceland for any time of the year! Like this post? Don’t forget to share it on Pinterest. What are you most looking forward to on your Iceland trip? Comment in the comments section below!